Last month I wrote a blog about how my Procrastination Monster has stalked me for many years. It’s sabotaged me from doing what I was put on this earth to do. I settled for a hollow life of joyless jobs and plans half-baked. I was a shadow puppet on the side-lines, afraid to follow my heart and play my part. Not any more! I’m a firm believer in opportunities finding us, rather than the other way round. When they knock at our door, we have to respond. Opportunity knocked when I fell into a ‘marketing storytelling’ role in a large UK Telco. From mouse mats to marketing plans, whitepapers to webinars, instead of dry facts about products, I wrote about the company heroes. These were the sales people (the beating heart of the business) and the wonderful clients they loved to serve. Important conversations happened. Relationships deepened. Profits soared. Many people find it hard to tell their story. They don’t realise they are shining stars who help their clients shoot for the moon and dare to go where they’ve never gone before. So I made it my mission to help companies tell unique ‘stories from the trenches’ about how they helped clients get out of theirs and together win the war. Last year, after much procrastination, I set up Copy That Sells to help small and medium sized businesses wear their heart on their sleeve through storytelling and share it with like-minded clients. How did I do it? Well I used Christopher Booker’s famous ‘Kill the Monster’ story to overcome my biggest enemy (the evil monster, procrastination) and rewrite my own. He said most situations in life fall within 7 key story scenarios. The Kill the Monster storyline is one you can use to show clients how they can stop procrastinating and start problem solving with you. Lesson 1: Relate to your client with a story about how you vanquished your own monster to be the brave, bright, bold ally who can help your clients overcome theirs. They will emotionally connect with you and seek your help to overcome what’s scuppering their plans. In this stage, the hero (you) dares to dream about the treasure that lies at the hard of your long, hard campaign. The monster is still a safe distance away. He stands between you and the prize (your happy customer). As Oscar Wilde said “A dreamer is one who can only find his way by moonlight and his punishment is that he sees the dawn before the rest of the world.” Don’t keep that dream to yourself. Find a way to share it with your customers and make it theirs. Lesson 2: Tell your client that they need to ‘kill the monster’, procrastination, in their own business before it’s too late. You have an idea which can help them implement a new approach to prevent a bigger problem, much more costly to fix. Impress upon them the time to fix it is now. This is the stage where the Procrastination Monster grabs you by the throat and won’t let you go! You weigh up the costs and wonder if it’s worth the effort to turn the bad situation around. Overwhelmed, you put your dreams on hold. Lesson 3: Show your customer you too felt frustrated with exactly the same problem. But prevarication will only make matters worse. Opportunity will be lost forever if they don’t take action. Tackle it now. This is the stage where you can’t decide what to do. The Procrastination Monster has pummelled you into a state of inertia. You paper over the cracks, you kid yourself the problems you need to solve might go away if you ignore them long enough. In Gone with the Wind’s Scarlett O’ Hara’s immortal words, you tell yourself ‘Tomorrow will be another Day’. Here you might be tempted to bring out your BANT (What’s the Budget, Authority, Need, Timeframe) qualification process https://www.process.st/bant-sales-qualification/ . However, make sure your conversation is buyer not seller focused, relating on an emotional level. Over 90% of all purchasing decisions are based on human emotions. People are people with the same dilemmas at the end of the day. 5. The Thrilling Escape from Death, and Death of the Monster. This is the stage where you take action and vanquish the Procrastination Monster. The grateful people give you a kingdom to rule over (your happy clients). So these are my proven life lessons for using the ‘Kill the Monster’ story to capture the Kingdom and help your clients do the same. We only live once. 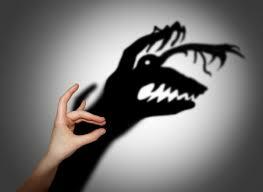 Let’s not play at shadow puppets. Let’s rewrite the true story of the life we’re meant to live. Let’s inspire our clients to rewrite theirs. Let’s beat this Procrastination Monster together!